Research has shown that the biomass extract of the neem seed is more effective than the formulations using Azadirachtin alone. 1 Debug® Turbo is a formulation containing 65.5% Fats and Glyceredic oils, Margosa (containing several triterpenoids & neem oil), 0.70% Azadirachtin and 20% synergist. Besides Azadirachtin, it contains 168 compounds that are chemically diverse and structurally complex. These include nimbin, nimbidin, salanin, nimosone, and vepol.Most conventional pesticides contain a single active molecule. Studies show that a single molecule is not suffi cient for botanicals. Formulations containing azadirachtin alone exhibit the following limitations: a) UV degradation, b) Oxidation and c) Acquired immunity. In short, higher AZA products degrade faster in sunlight and targeted pests become resistant. In one study 2, a line developed a 9-fold resistance to pure azadirachtin treated weekly after 40 generations, whereas a parallel line treated with neem extract developed no resistance to the compound. In another study3, products containing complete spectrum neem biomass, coldpressed neem oil, and a lower concentration of azadirachtin was more effective than 3-4.5% Azadirachtin product. 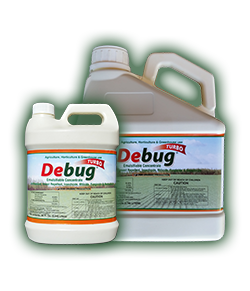 Compared to other products, the Debug® Turbo solution is more effective, has better broad spectrum capability, better stability against UV degradation and decreases the likelihood of insects developing resistance. Debug® Turbo can be used in tandem with conventional pesticides, pyrethrins and spinosad to comply with EPA established tolerance limits. It can also be used in restricted buffer zones (bordering residential areas) to increase crop acreage. Debug® Turbo has one of the lowest re-entry levels (REI) and preharvest intervals (PHI) so the crop can be harvested the same day. Benefi cials can be used synergistically or in tandem with Debug® Turbo as they do not harm benefi cial parasites and predators.